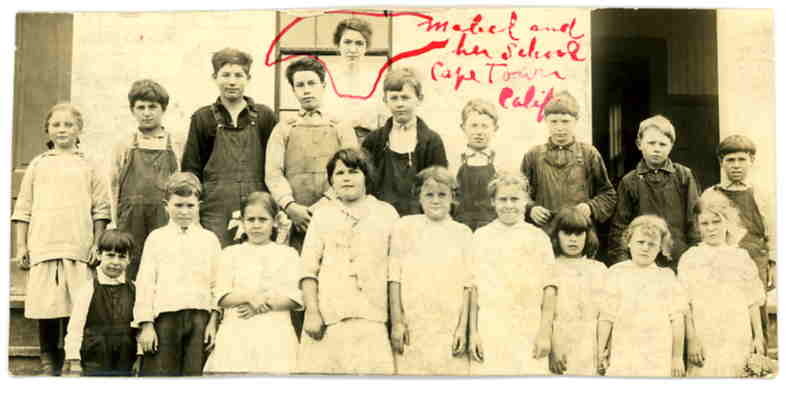 My great-grandmother teaching in a one-room schoolhouse in Cape Town, Northern California. Gretchen has taught at the graduate and undergraduate levels for over a decade and currently teaches at the University of Utah and at Georgetown University. She also has taught at MIT, Knox College, University of Missouri, Barnard College, the Kenyon Review Writers Workshop, and elsewhere, and is frequently invited as a visiting lecturer and workshop instructor. She has taught in departments of English, Creative Writing, Comparative Media Studies, Art History, Museum Studies, Environmental Humanities, among others. Her classes often go beyond the classroom. Her class field trips have ranged from the Isabella Stewart Gardner Museum and other sites in Boston, to the National Gallery of Art and National Press Club in Washington, DC, to the Utah Museums of Natural History and Art in Utah (including Nancy Holt’s Sun Tunnels in remote Western Utah), to state parks in the Sierra Nevadas of California, and countries throughout Europe, along with concerts, literary readings, and theatrical performances. A good course or workshop is like a good story: it must weave a combination of related readings, exercises, and assignments into an overarching narrative, rather than cobble together a group of exemplars packaged by genre. Exploring the evolution of genres and disciplines and questioning their bounds, my students and I engage with open rather than closed traditions and try to thoughtfully articulate the literary, artistic, and cultural lineages out of which we write: not in a vacuum, not works of genius, but rather wedded to communities and production processes that make language itself a living and malleable medium. Having taught at the university-level for over a decade, both undergraduate and graduate students, I have designed many creative writing, literature, and cross-disciplinary courses. My classes encourage varied explorations and range from entry-level introductions that cultivate craft and curiosity, to more advanced theme-based workshops and critical literary courses, to surveys exploring literacies of genre evolutions over history and textual artifacts across media. My rigorous and untraditional creative writing workshops (examples include “The Literary Hybrid,” “The Art of Text,” “(un)Writing the Book,” “Writing & the Museum,” “Tectonic Essays”) are bolstered by critical discourse and inquiries, where students become not only active writers but also active editors and collaborators. I am committed to the editorial process, to collaborative and varied modes of critiquing and peer review, and to traditional and non-traditional assignments, including fieldwork and archival research. My experiences with a variety of technology platforms (including Moodle, Blackboard, WebCT, WordPress, and others) allow me to incorporate listening and viewing modules among reading and writing assignments. My versatile expertise and experiences have been useful to students from diverse disciplines and backgrounds, and my student evaluations have been consistently excellent. My hope for all of my students is to cull from my courses how to be creative thinkers, how to manifest creative thinking through writing: to be curious, to play and make mistakes and try again, to pare and polish and relish process as much as product, to seek out and participate in varied resources and experiences, to accept and give constructive criticism, to use language in innovative, thoughtful, complex yet clear ways—and to take these lessons beyond the workshop’s end. I am deeply committed to mentoring: investing in students as they investigate their craft and questions, recommending readings (and viewings and listenings), and introducing them to various contemporary literary and artistic communities to round out their sense of what it means to be a working writer and thinker. Writing (like speaking, or sign language, as the case may be) is the fundamental base of communication, so the ability to use language creatively and skillfully will benefit not only future writers, but also future scientists, artists, economists, historians, doctors, musicians, and so on. In our fractured world, the ability to communicate—across a classroom table, across disciplines, across national boundaries—holds the promise of community building. That is why to me, depending on how writing is taught, it can be more than a tangential or precious part of the curriculum, but rather centrally related to and generative for all disciplines: a way for students to explore how language can foster communication across whatever subjects and fields. Having taught in a variety of classrooms over the years—from “bootcamp” workshops for professors and graduate students to lecture halls, from one-on-one tutorials to university classrooms (with departmental affiliations including English, Creative Writing, Art History, and Comparative Media Studies) and beyond, to ESL and GED classes, adult continuing studies, summer middle school, high school (in two departments, English and History, as well as piloting an interdisciplinary program in American Studies for three years), and other experiences, I have witnessed a variety of learning strategies and know there are as many kinds of pedagogical approaches. Just as I am committed to creative writing, I am committed to creative teaching and creative living. At a time when students’ lives are being profoundly shaped by rapidly changing information technologies, economic stresses, and other transformations, I hope their exploration of writing in many forms can help them to become conscientious consumers and interpreters of the world around them: to adapt, participate, and affect change in this changing world. “This was an incredible class. It forced me to experiment with new ways of writing and researching, but I still think that I produced a piece of writing that is uniquely my own. Many more excellent teaching evaluations, available upon request. As one extended project in pedagogy, I gathered interdisciplinary material and digital resources around “deforming” as classes at different colleges and universities engaged my collaborative project, Galerie de Difformité. Classes have been involved at over 20 colleges and universities, including MIT, Temple University, Hamilton College, Kenyon College, NYU, Pasadena City College, University of Utah, and elsewhere, resulting in a range of projects (creative and critical writing, art, new media, curated exhibits, blogs, videos, pop-up performances, among others). Professors have presented their involvement in the project at the annual conferences for the Modern Language Association, American Literature Association, and other venues. For more about this project in pedagogy with “Resources for Teachers” (including syllabi and sample assignments), click here. Looks like a book, feels like a book, reads like a book, but: what constitutes a BOOK? This weekly creative writing workshop explores and plays with the material and historical components of the BOOK in order to derive and (re)generate individual and collective writings. Each week, we will read authorial appropriations of bookish components (for instance, using the index as a means of memoir, sequencing stories and poems exclusively through footnotes, treating the colophon as a pet that needs to be tended), taking apart the BOOK in order to put it back together again: in reimagined ways, shapes, and forms. One week we will study variations of back matter (synopses featured on the back covers of books) in order to write some of our own—for non-existent books—thereby co-creating a phantom library. Over the semester, we will ponder and pander to the book as object, as history, and as mystery to consider where this technology has come from, to envision where it might go. From Gutenberg’s printing press and its revolutionary reproductions, to Tristram Shandy’s famous “marbled page” (unique to each volume), to our current culture of technotexts and collaborative narratives (even a Twitterature version of Tristram Shandy), we will develop a repertoire of book-related vocabulary and a range of experimental approaches to creative writing practice. 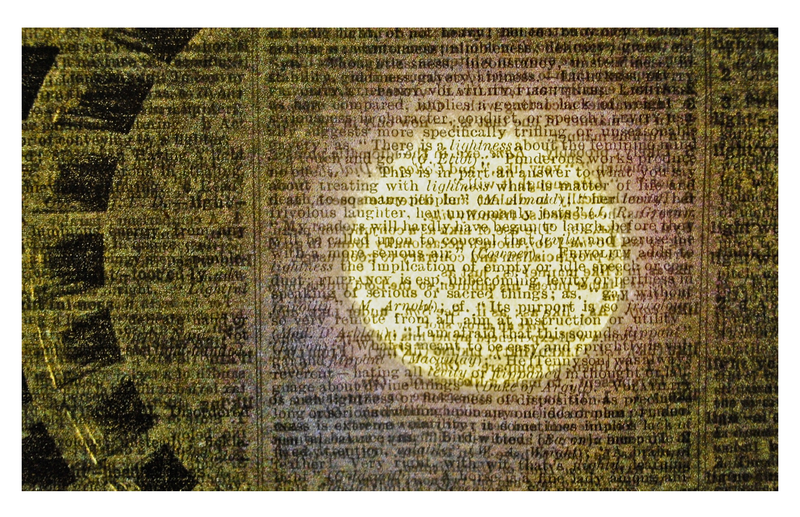 Historical alterations in storytelling, poetry, the essay, and hybrid genres will give us cues about how to turn the physical BOOK inside out, remaking it materially and conceptually into a final project. Using the malleable medium of language, we will ask a recurring question: What is a BOOK? Is it an artifact on its deathbed or a durable technology evolving into future forms? 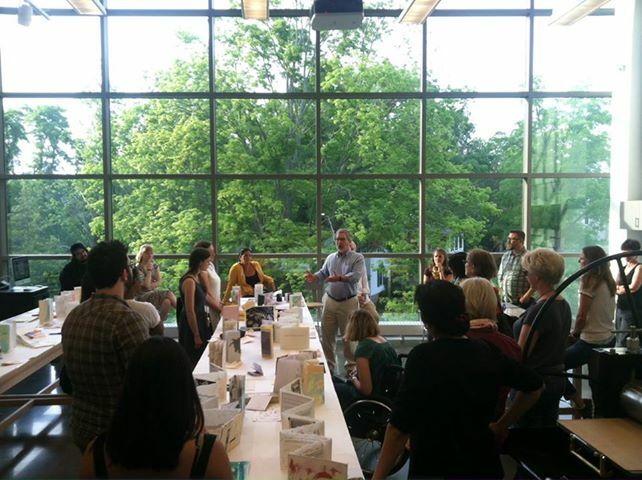 –Summer 2015 and 2016: “The Art of Text” blends techniques of fiction, nonfiction, poetry, and visual arts to generate creative writings through the art of the book. Using a range of exercises and materials, we will push into new terrain through textual and visual explorations. Whether you are a writer curious to write in more genres, or an artist wishing to deepen your engagement with text, this workshop promises to open up a variety of creative practices to generate new content and form. 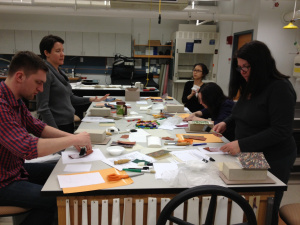 Co-taught with book artist, Ellen Sheffield. Invited lectures, classes, and workshops across genres and disciplines (creative writing, literature, museum studies, art history, health sciences) at a range of universities, including New York University, Hamilton College, Berea College, and elsewhere.